Garlic is extremely versatile and is found in many recipes. Its well-known for its amazing antioxidant properties and ability to reduce cholesterol. Apart from cooking with and eating garlic, the juice in fresh garlic will also strengthen and harden weak, brittle fingernails. Leave the juice to dry, then wash off if you can’t stand the smell. Dab some toner over your nails before applying any nail polish. This will remove all traces of oil and helps nail polish stay on much longer. If you don't have toner, lemon juice works too. With nails so brittle and soft that they could never grow at all, I decided to try the clear polish/garlic a try. The hardest part was letting it sit for 10 days. On the 10th day I took all the ridges and buffed my nails; the polish did smell a bit like garlic when I applied it, but in the morning the smell was gone. After two weeks I noticed that my nails we not splitting any more and an added plus…they were growing like crazy. I now apply a fresh coat of polish weekly and have to trim my nails because they are just growing, growing, growing. This really works!!! Usually, I try tips for my nailx, and they never work, but, I tried this tip, and it really worked. My nails were so badly damaged from artifical nail tips for well over 22 years. I chopped fresh garlic and put it into clear nail polish. I’m not very patient, so after applying it weekly for a few months with no results, I gave up. But, after a while I noticed my nails had stopped peeling and tearing off. The nail bed is now healthy, and my nsils are stronger and actually growing. Be patient, if it worked on my nails, it will work for anyone. Just give it time. THIS IS GREAT BECAUSE IF GIVES YOU LONG NAILS AND I HAVE A BAD HABBIT OF BITTING THEM SO NOW I CANT BECAUSE IF I DO THEN I CAN TASTE THE GARLIC.SO NOW I DONT BITE THEM AND THEY ARE STRONG. how long can the garlic stay in the botlle?? Wow, it’s interesting. I never thought that garlic can strengthen and harden fingernails. Certainly, I will test this practical and inexpensive method! a jamaican friend told me to put garlic into clear nail polish to make them strong. i was scepticle but now ive read this im def going to try it. all those brand name hardners dont work for me. Sally hansens hardener worked for me. But I really want to try the garlic tip :)Sounds interesting! I recently tried this garlic trick! I dabbed some garlic juice and let it sit on my nails for about 25 minutes and even put on rubber gloves while it sat so that I could do my daily duties and then i infused some actual minced garlic from the leftover clove and put it into my nail polish and polished my nails, I hope it works. yea ino i tried it so awesome! Garlic really works for strengthening your nails. My great grandma thought me this as a kid late 70’s early 80’s. She also made me the nail polish (glad to hear i’m not alone in that one!) My nails are very strong and long. When i tell my friends about the garlic trick, they don’t belive the crush garlic in the nail polish, or the fact that i never pass on the opportunity to peel garlic when anyone is cooking after all these years. It really works! me too my grandmother always uses garlic on her nails , she has super thick and long nails even the nailcutter won’t cut it because it’s really strong ? Just made a batch of this a couple days ago. Just waiting a couple more days for it to set. Can’t wait to try it and see see results!!!! I’ve tried piercing the cloves with my nails and I can’t believe how hard it has made them!!! My nails were soooo paper thin it wasn’t funny!! I was actually considering going to a salon to have some artificial nails applied but then came across this article. What a savings!! It would have cost me $45.00 plus taxes to have them put on and then $25.00 every 3-4 weeks to apply filler to them, and for .50 cents, I have 3 bulbs of garlic at my disposal… IT REALLY DOES WORK!!!!!!!!!!!!!!!!!!!! My sister just told me about this remedy today, so I am going to try it and can’t wait to see how this goes for my nails! They are a 100% stronger. Please try this in some clear polish. My aunt has been dOing this for years and lately my nails had been peeling And cracking, so I asked her tO make me some and she did this is my second day trying it and my nails seem stronger than yesterday, it might sOund crazy but the garlic smells kind of good mixed in with the polish, lol! one of my good friend in high school had an amazing nails, I asked her what u do? and she told me that she cuts the garlic in half and puts it in a clear nail polish and uses it.. i didn’t really believe her this was back in 2004 and after 8 years my nails been cracking, breaking, they change color because i put so much nail polish on, they turned yellow.. so i said let me try it.. and i did and it actually worked 🙂 GARLIC is amazing.. i know a lot of ppl say eeeww it smells and stuff but girls the smell disappear after 15 mins wash ur hands 3 times with soap u should be fine. and beside nobody is gonna go smell ur nails lol.. but it really WORKS 🙂 TRY IT. Does garlic grow nails too? i play flamenco guitar and a guitarist recently told me about this. at first i didn’t believe him then i saw so many post about it so i tried it and it worked. in like 10 minutes the juice dried and the smell went away but my nails were as hard as rock. So sad, I started using garlic for my nails, but now the garlic smell is giving me migraines! =( But I love how awesome my nails look, but can’t justify using garlic anymore if I am going to get migraines. Any other suggestions? Hmm… if you don’t mind the chemicals, you could try adding cut-up garlic pieces into a bottle of nail polish, let it sit for a few days, and then just use the garlic-infused nail polish. I think that should mask any garlic smell quite well. 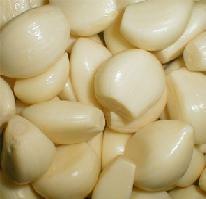 If not, you could try wearing gloves (eg disposable surgical gloves) after using raw garlic juice on your nails. You’d probably need to wait for your nails to dry first, so there’ll still be some smell for a while, though. After you have applied the garlic clear polish,wash your hand with a fresh cut lemon. It really works! I tried it and my nail turned white! I am trying this on my nails right now and it feels really good and it makesnmy nails quite shiny too. I am going to try this because there are so many positive comments about this treatment. I’ve tried all sorts of ways, but I love nail art, and yet I can’t even my nails properly… 🙁 So I’m really excited!!!!!!!!!!!!!! I poke a small hole in the garlic clove & then using a small lipstick brush paint the garlic juice on my nails each night before going to bed. My nails are amazing now. This is something that I learned long time ago I used to bite my nails for the long time my dad try everything for me to stop that until one day I did bite my nail really short and I got a really bad infection that was the last time that I eat my nails after that I start fresh garlic at night time and my nail and since then I always a lot complements about my nail they are strong and really long all the time I love my healthy nail. sometimes people ask me if they are my real nails and I feel really good to say yes they are my real nails. this really works I been doing it for many years I was 16 yrs old when I start it and I am 43 now.